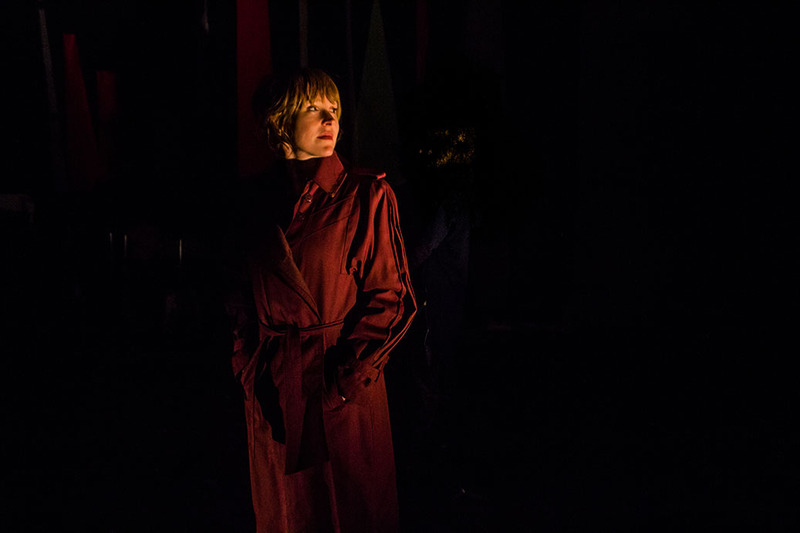 From GALA Hispanic's production of EN EL TIEMPO DE LAS MARIPOSAS, about four sisters who gave their lives fighting dictatorship in the era of Trujillo. This production featured a combination of historic merengues and bachatas, as well as original music based on the contemporary reggaeton style. From Laura Esquivel's beloved novel. At one point in the show, this musical sequence was used to cover a longish pantomime depicting 15 years passing in the life of the de la Garza family. (I was reminded of François Couperin's "Les Barricades Mystérieuses" while creating this music, so I guess that makes it an hommage of sorts.) 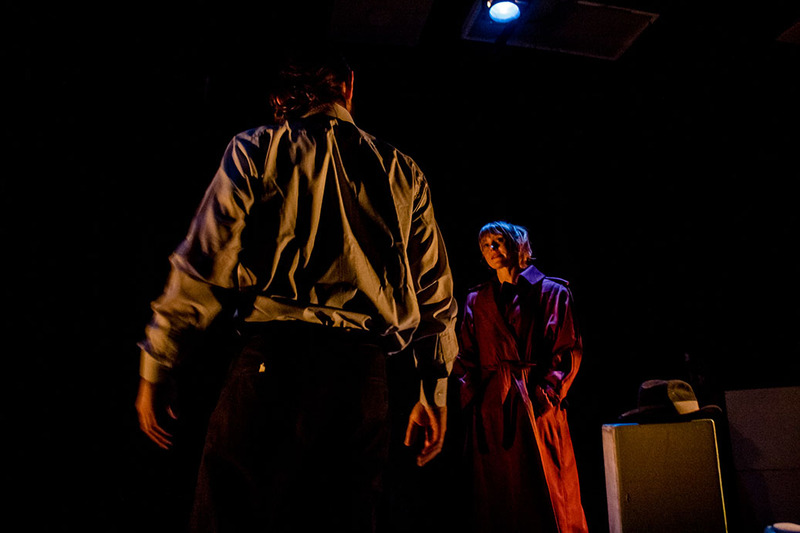 Production photos by Daniel Martinez. don Juan Tenorio, Gala Hispanic Theater, Washington, DC, 2017. 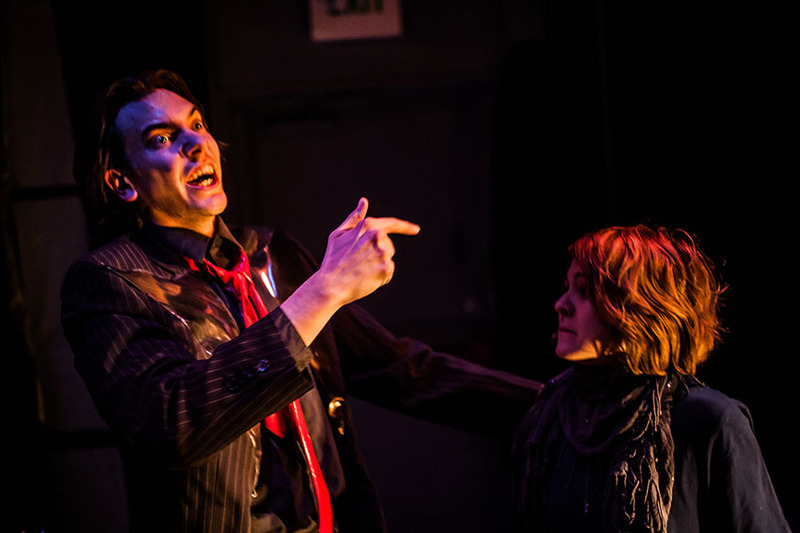 The Master and Margarita, Annex Theater, Baltimore, 2016. The Year of the Rooster, Single Carrot Theater, Baltimore, 2015. Richard III, Chesapeake Shakespeare Company, Baltimore, 2017. 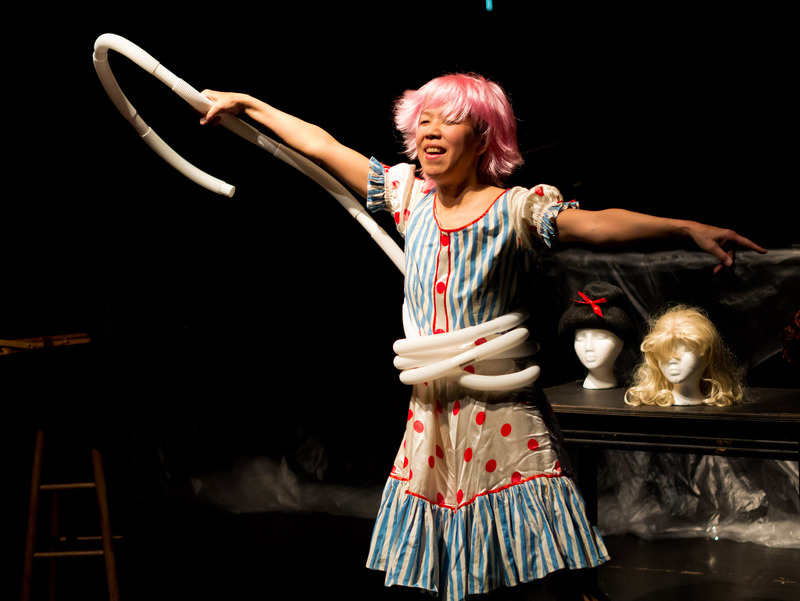 For her 2016 Theatre Project performance Subject/Object, Naoko Maeshiba, true to form, wanted to turn the theater around backwards: to swim down the ranks of audience seating through billowing plastic waves created by Khristian Weeks, lit from beneath, and to emerge from under the first row of the audience as a newborn creature. Not a problem. Household LED lamps were used under the plastic to prevent heat buildup, and we devised placements that gave the look we wanted. For an appropriately hot look for the "birthing" sequence, small theatrical units were placed in the front row and carefully monitored. 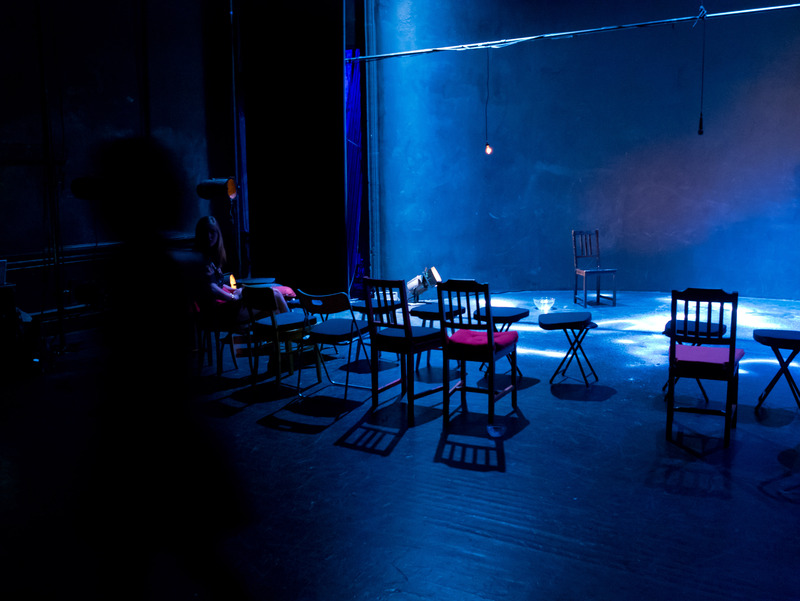 After a second act that was a comedic cabaret, the third section of the piece turned dark and mysterious as the audience, now facing upstage, witnessed a performance tied together by mystery, sound and salt. 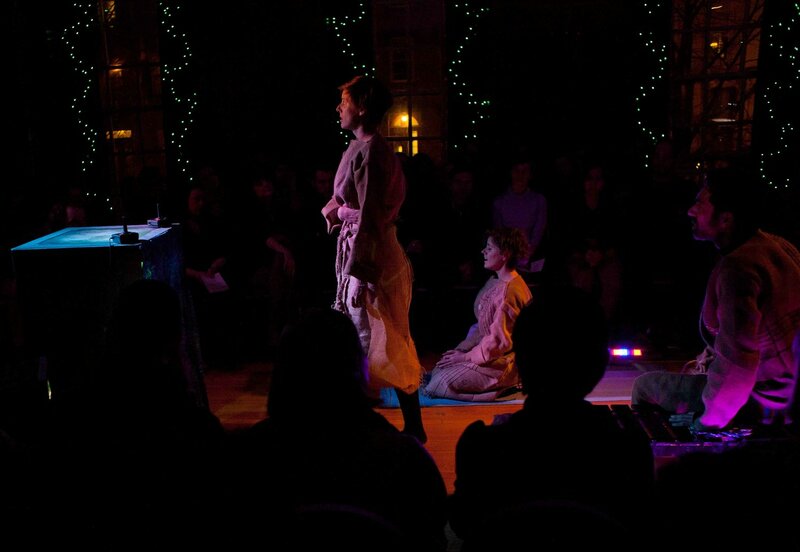 The piece ends with the performer retracing her path up through the audience seating to the dim expanse at the top of the house. Naoko Maeshiba makes an entrance. Naoko under the first row of audience, before the "birth" sequence. 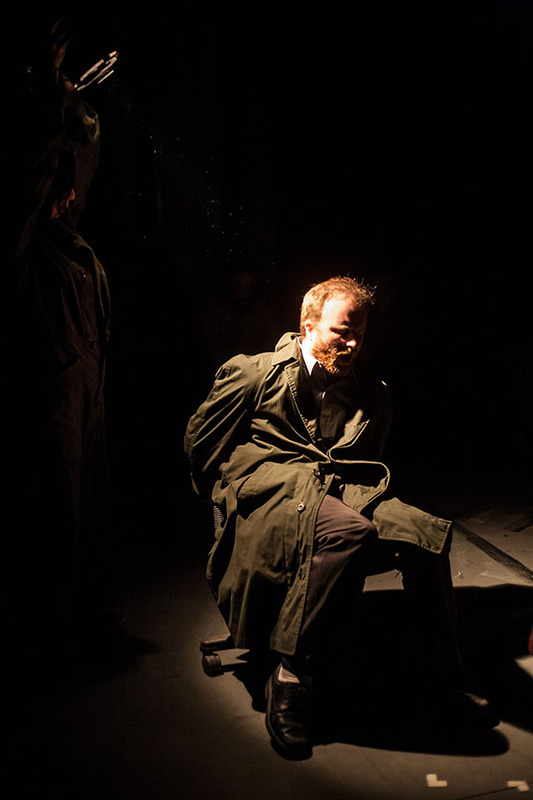 For this unique noir tale of urban corruption, director Trevor Wilhelms wanted a shadowy, fluid treatment of the lighting that could be controlled by his actors during performance. Four small spotlights of the sort used in store window displays were hand-held by performers and controlled from the dimmer system. 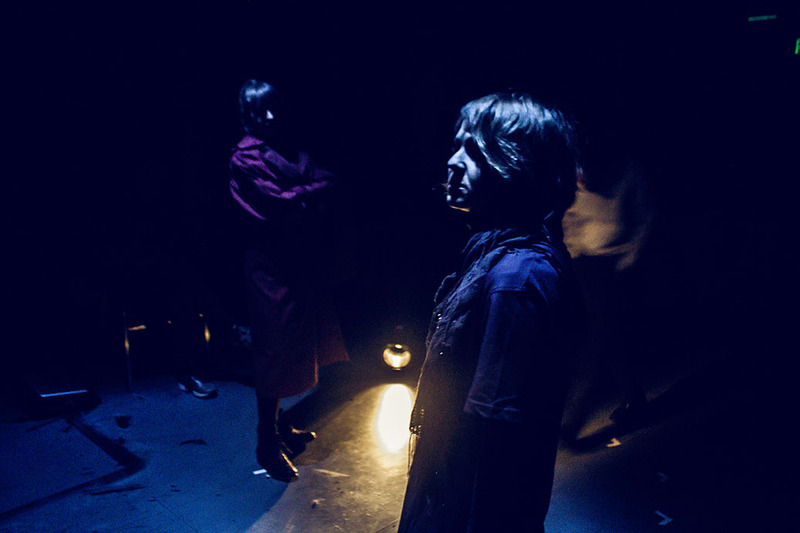 This unique system of low-tech "moving lights" permitted many unique effects to be produced, which lent the story the demimondaine aspect it deserved. Bridgette (Autumn Breaud) and Sheriff Brown (Scott Burke) discuss politics. "In The Fête of Mistakes, Psychic Readings Co constructs an abstract fairground littered with the overwhelmingness of despair and the sustained tension of hopefulness." 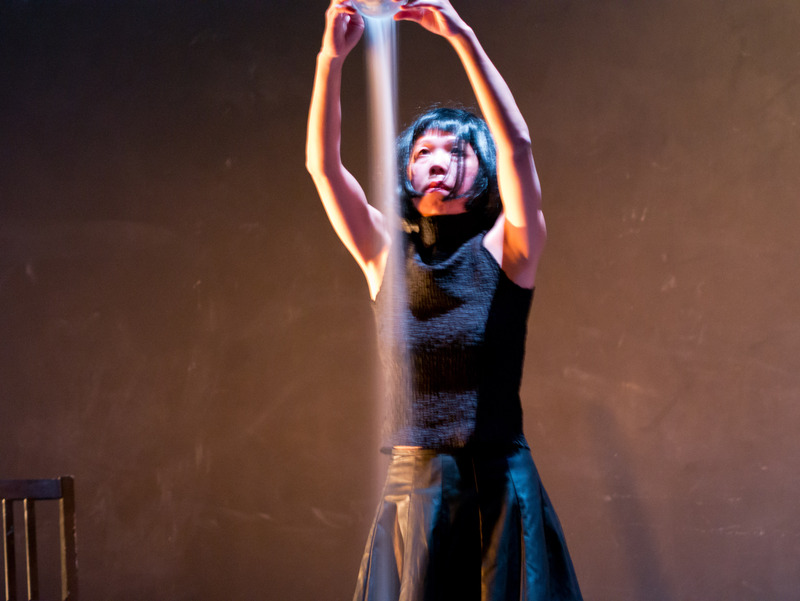 This production, produced by Psychic Readings Theater, given at Baltimore's Le Mondo in December 2016, presented a number of interesting challenges and opportunities. 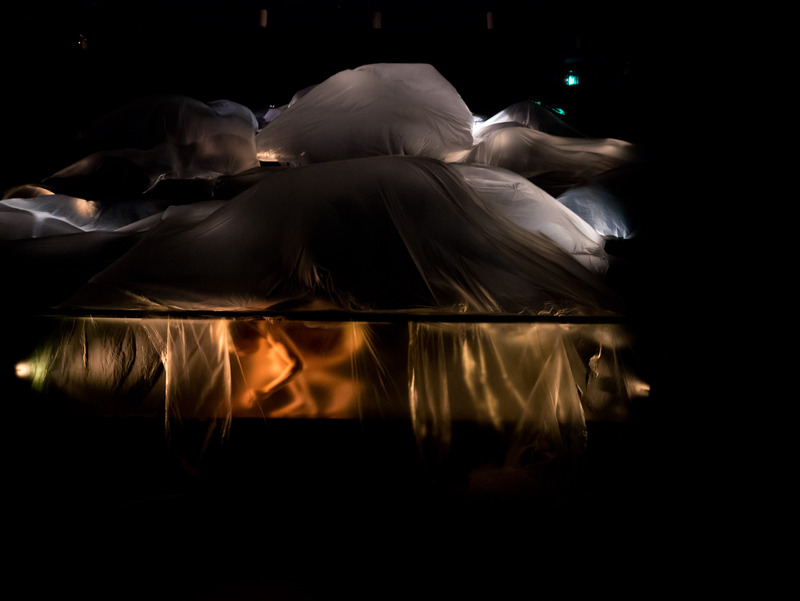 The performance space, having no existing lighting system, grid or other infrastructure, was adapted into an intimate, even claustrophobic theater that opened out into the wider space of Le Mondo for a spectacular finale demolition derby. Lighting instruments, ranging from LED flashlights to clip lights to standard theatrical fixtures, were used to create a shadowy, subterranean space situated (or not) beneath Niagara Falls. 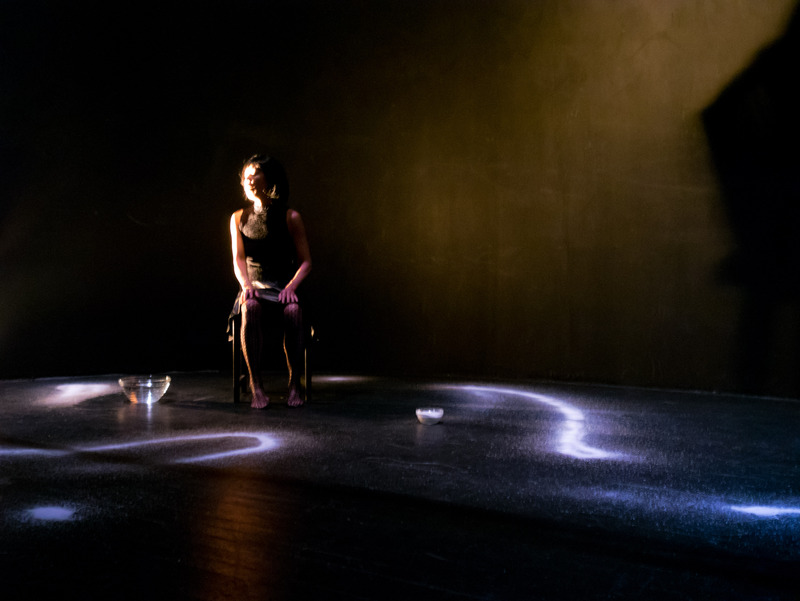 Projections were carefully prepared to create a seamless, hypnotic moving mandala and other apparitions which helped propel the plot of this all-American demimonde. “But you must hurry! Don’t you dare be late! Ric and Fiona have a moment. Jon Jacobs, as Jesse Heffler, looks on. Actual bingo and zeppoles, with Jesse Heffler assisting. One of my favorite classical works is Mozart's Magic Flute, a singspiel that is connected, not only to high opera, but to the rowdy German music halls of its time. So I was delighted when, in 2015, Annex Theater asked me to help as music director in staging this gem in a tiny, 30-person theater on North Avenue. Budget ruled an orchestra out of the question—the score would have to be played on computer and built in software—but it occurred to me to embrace this fact by scoring the orchestra as a collection of sampled toy, mechanical, and a few historical and folk instruments. By "historical" I mean samples of not just 18th century orchestral instruments, but also authentic 1950s and 60s synthesizers, including the unique Jennings Univox, a vacuum-tube instrument from 1954. The result was an exceptionally warm and unique accompaniment for the singers. The score was mixed in 4-channel surround and played back on computer. Annex company member Jacob Budenz joined me as director of the singers, and we collaborated on stylistic details; Evan Moritz directed the staging, and Doug Johnson provided magnificent painted backdrops that paged like a giant picture-book to reveal the settings. The orchestration of the quintet "Hm! Hm! Hm!" 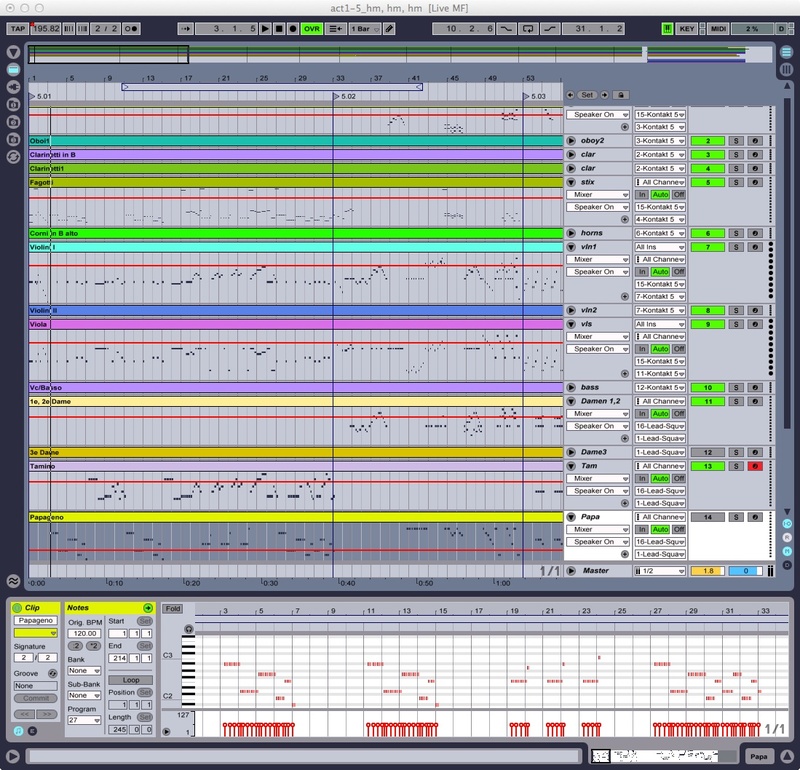 featuring (the magically silenced) Papageno, Tamino and the three Ladies, set up for editing as MIDI data in Ableton Live. 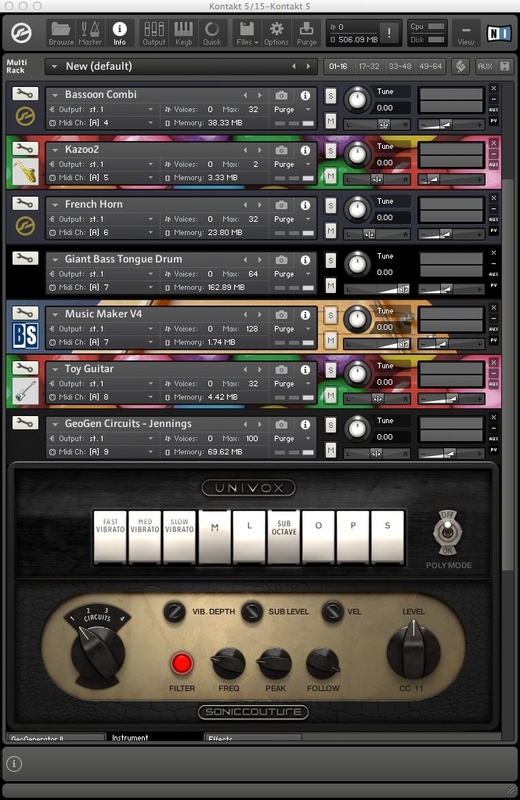 A "rack" of digitally-sampled instruments in Native Instruments' KONTAKT application. Note the presence of various toy instruments. The panel at the bottom holds controls for the Jennings Univox synthesizer plugin. 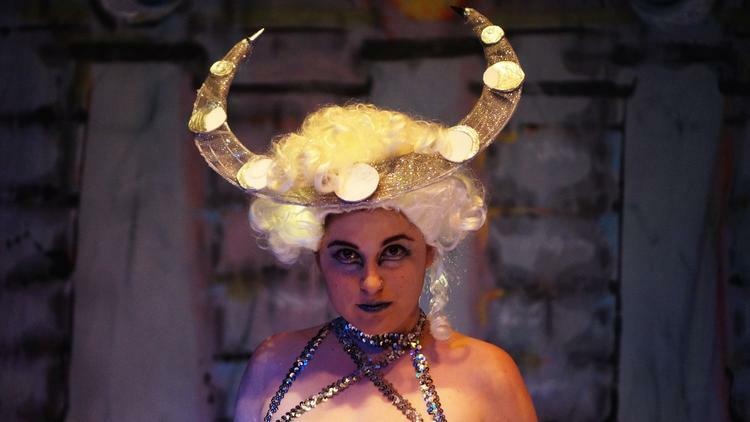 Allison Clendaniel as Queen of the Night in Annex Theater's production of THE MAGIC FLUTE. A page from the Queen of the Night's first aria. Red markings indicate "rehearsal letters" corresponding to phrases to be manually cued in performance. 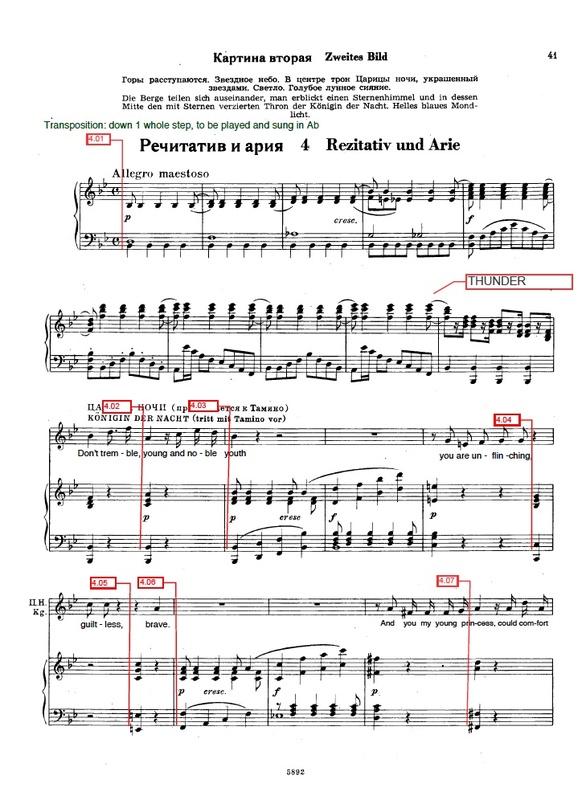 We found a Russian-language piano score that had plenty of space to insert our new English translation. The music was broken up into phrases for easier rehearsal cuing, and larger sections to be manually cued in performance by the stage manager. 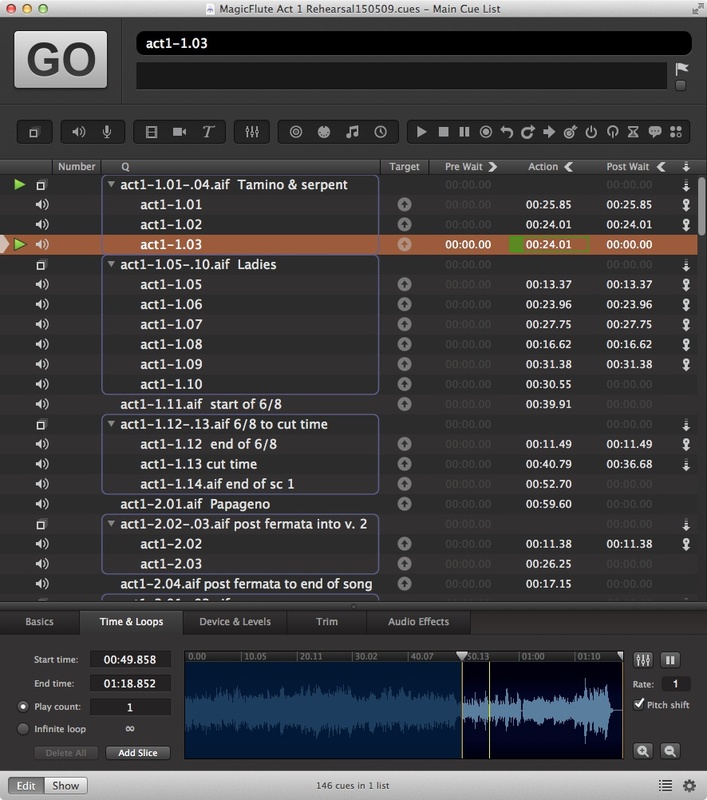 This software is Qlab, from Baltimore-based company Figure 53. A brief excerpt from the Overture using sampled toy and mechanical instruments. Playwright Nelson Rodrigues revolutionized Brazilian theater in 1942 with this dreamy, radical story of the death of a young woman in the 1920s. 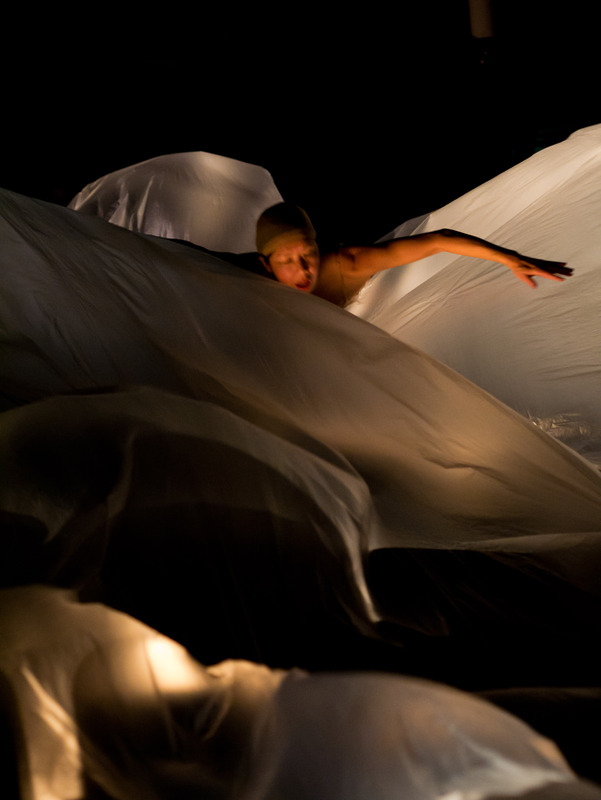 Director Rebecca Holderness and set designer Vicki Davis devised a white, fragmented playing space sliced in two by a sheer curtain that ran diagonally for the entire width of the theater. 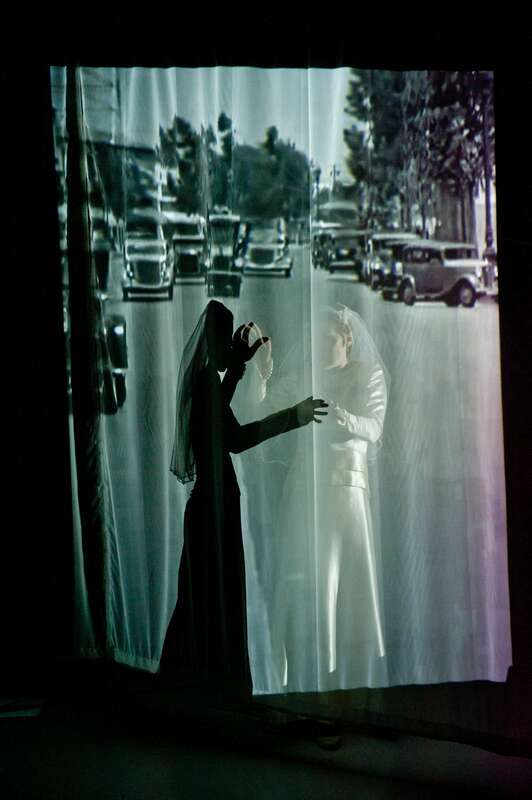 The video design for this project was based on a small projector mounted in a housing that mimicked the movie cameras of the day, and allowed projected imagery to play across the curtain, permitting actors to have access from either side, and also to "shoot" video onto actors' bodies, upstage walls and other surfaces. I also contributed the sound design for this project. Video of Rio de Janeiro traffic projected onto a sheer curtain, with an actor behind "mirroring" her own shadow. The playing space with the curtain open. Note the projector in its housing on a tripod to the right, and the image on the floor, where the actor is looking. 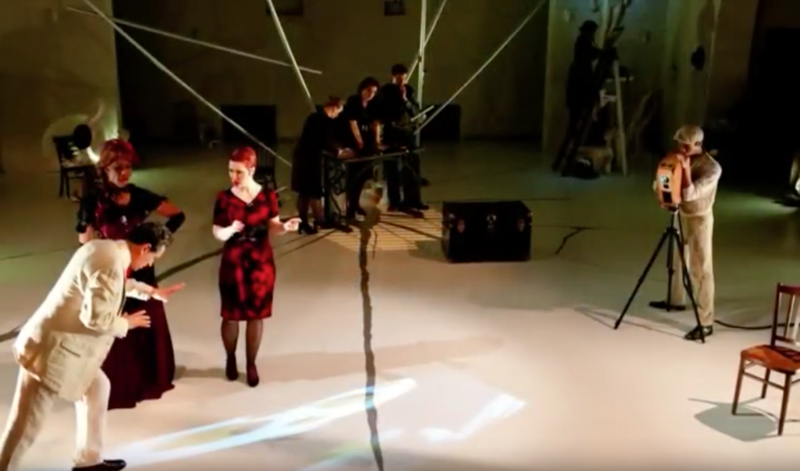 After working with Baltimore's Rhymes With Opera on David Smooke's Criminal Element, we discussed creating lighting and video for operas that are specifically intended to tour in a standard minivan. Adam Matlock's Red Giant was an excellent choice for this. 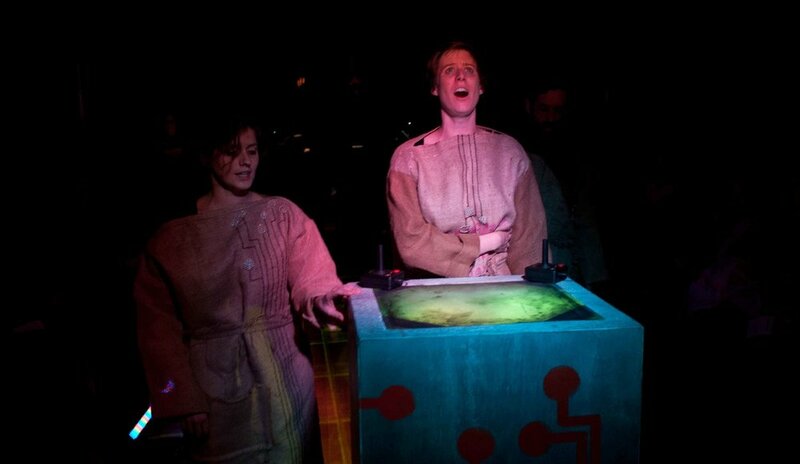 Set in a time when the Sun has become a "red giant" and is about to engulf the Earth, this opera follows three individuals who, among many others, have built jury-rigged spaceships and blasted off for destinations unknown, to escape certain destruction at home. The lighting rig was very simple: a few instruments on either end of a tiny (8' wide) playing area, LED strip lights along the sides of this "rocket," and a scrim upstage that screened the orchestra (a home security monitor provided a conductor's video feed to the singers via a small CRT that was part of the set). Complex colors and imagery were provided by a single video projector mounted behind and above the action, which washed the singers with nostalgia-laden imagery as they sang of their lost home. 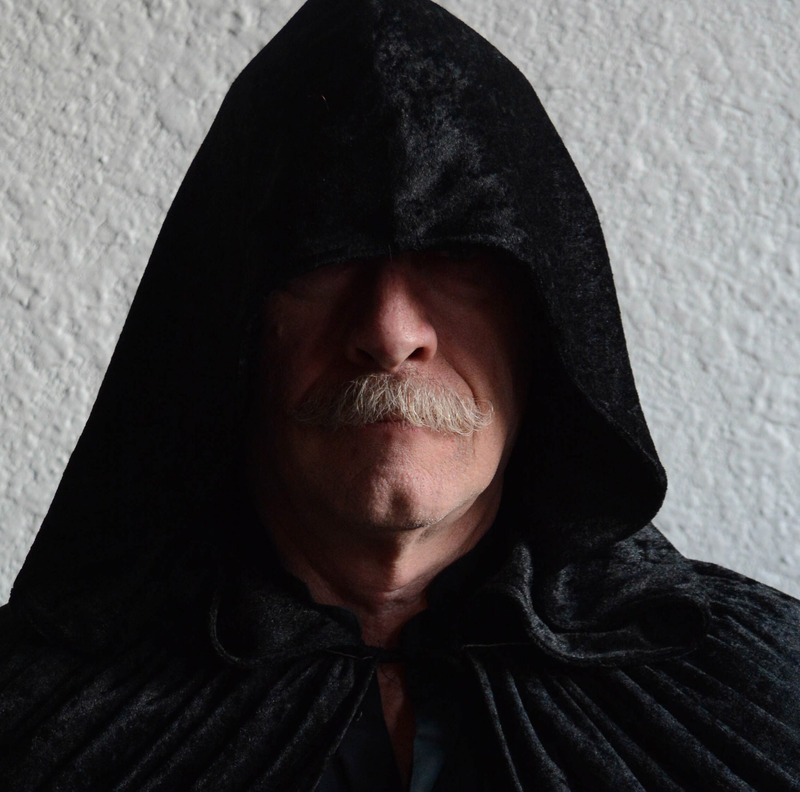 Occasionally, I am called on (or inspired) to compose songs for particular scenes in the plays I design. Here are a pair of songs from recent shows. A character in Annex's MASTER & MARGARITA inspired Dan Hanrahan and myself to create a song for the mysterious redhead demon, Hella, here sung by Kristen Toedtman with Portuguese lyrics by Dan. The story of Haruki Murakami's KAFKA ON THE SHORE revolves partially around a song, created during the 60s by a young, amateur musician, which threads throughout a tale of love and redemption that spans 50 years. The thought of period Japanese "rockabiri" music and a mournful Badalamenti-esque baritone guitar inspired this tune, here sung by cast member Julia Nakamoto and with lyrics by Murakami himself. 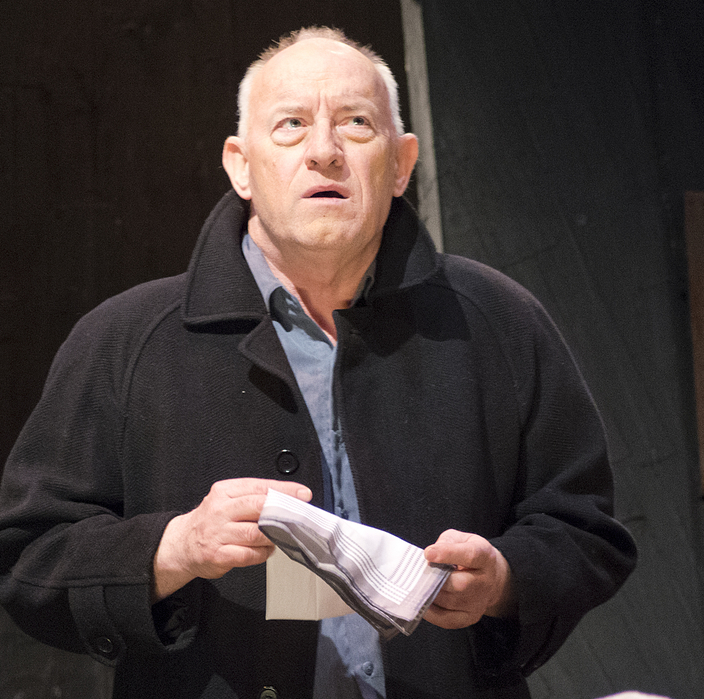 I have been fortunate to play a number of acting roles, ranging from a composite character in Annex Theater’s Macbeth, who witnesses the action of the play in a drunken post-battle fugue, to a classic role as Father Jack in Brian Friel’s Dancing at Lughnasa, to a funeral director with a twist in Annex’s UBIK. These opportunities have deepened my understanding of the totality of theater on both sides of the footlights. The Old Man in Psychic Readings’ The Purple Flower (2015). 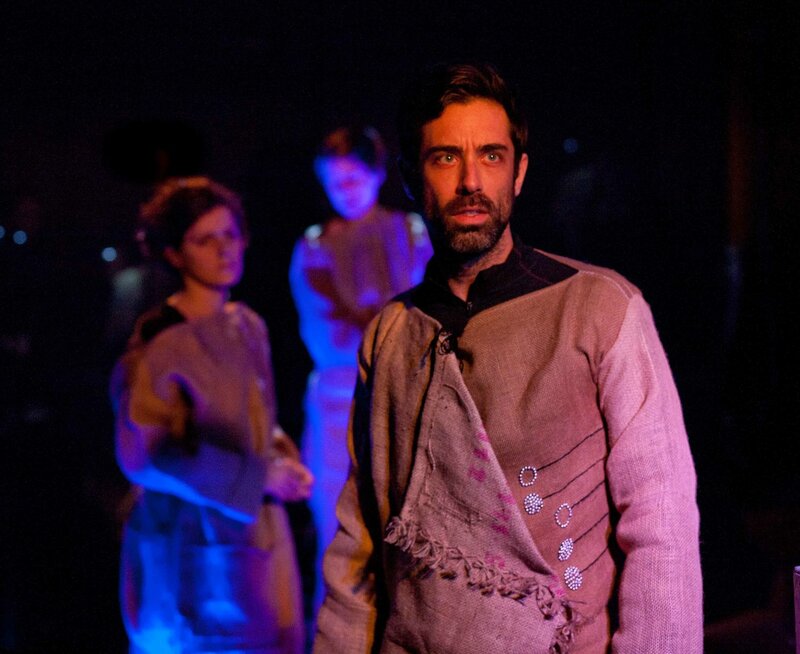 The Second Messenger in Two Suns Over Thebes, Annex Theater's adaptation of The Bacchae (2013). 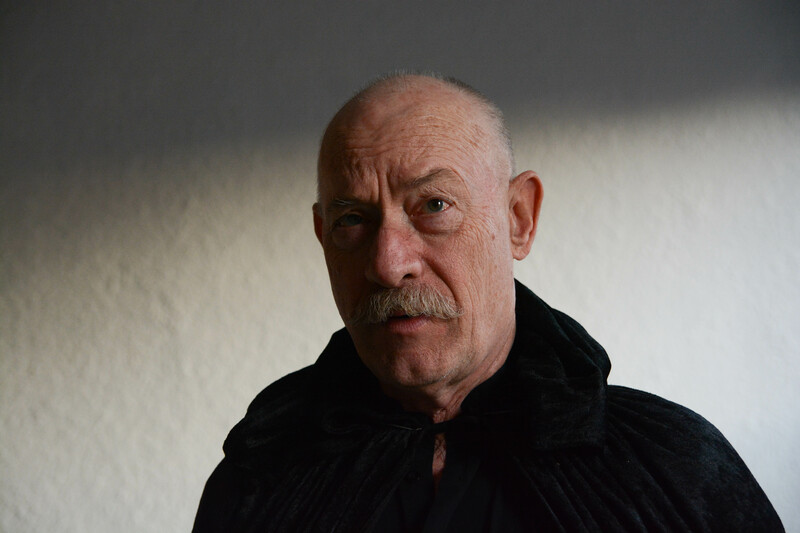 Herbert Schoenheit von Vogelsang in Annex’s UBIK (2012). Another head shot from SALOMÊ.